I hope today, in between food and football and family, you will pause to focus on all for which you are thankful. And I’m not just talking the obvious like a roof over your head and food on your table and good health. 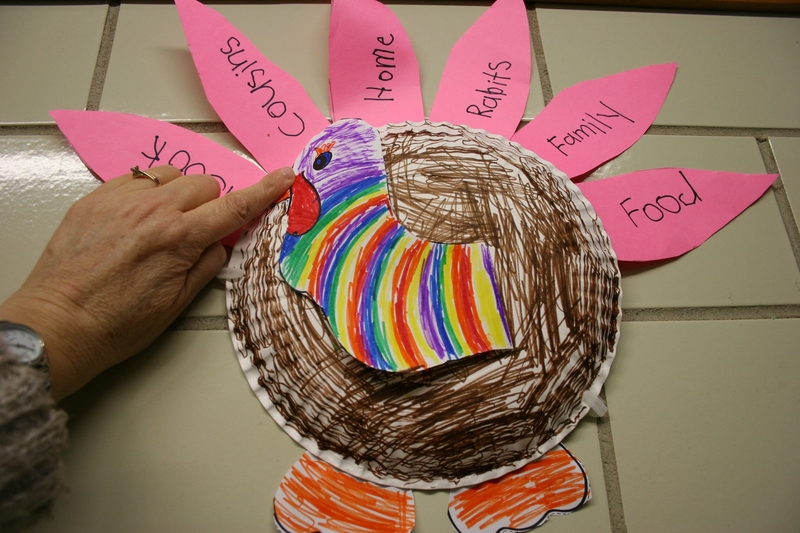 Artwork photographed last Thanksgiving in a hallway at Faribault Lutheran School shows those things for which one student was thankful. Minnesota Prairie Roots file photo 2013. Think deep. Think emotional. Think specific. I am grateful to God for giving me strength to endure the many challenges I’ve faced this year. Often I’ve wondered if/how/when I will make it to the other side. I’m sure you’ve all been there in some way at some time in your life. No matter what happens in life, the sun still rises each morning. 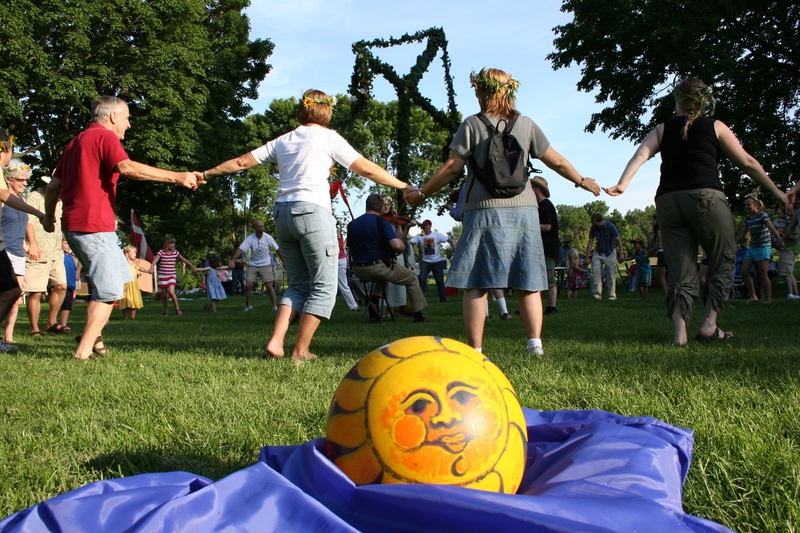 Here dancers celebrate the Summer Solstice during a Midsommar fest in Northfield, MN., in June 2012. 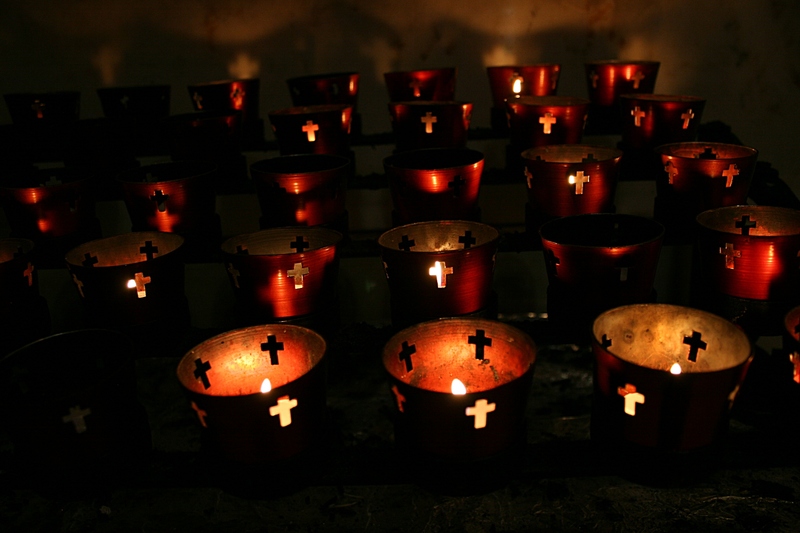 Candles at the Saint Paul Cathedral, St. Paul, MN. Minnesota Prairie Roots file photo. My faith in God sustains me. Those are not simply trite words written without a belief that runs deep and wide through my soul. I am also thankful this year for the recovery of my 82-year-old mom who suffered severe injuries in a fall that landed her in a trauma unit several months ago. What are you giving heartfelt thanks for this Thanksgiving? Have a blessed and wonderful day contemplating that for which you are grateful, in the company of those you love. 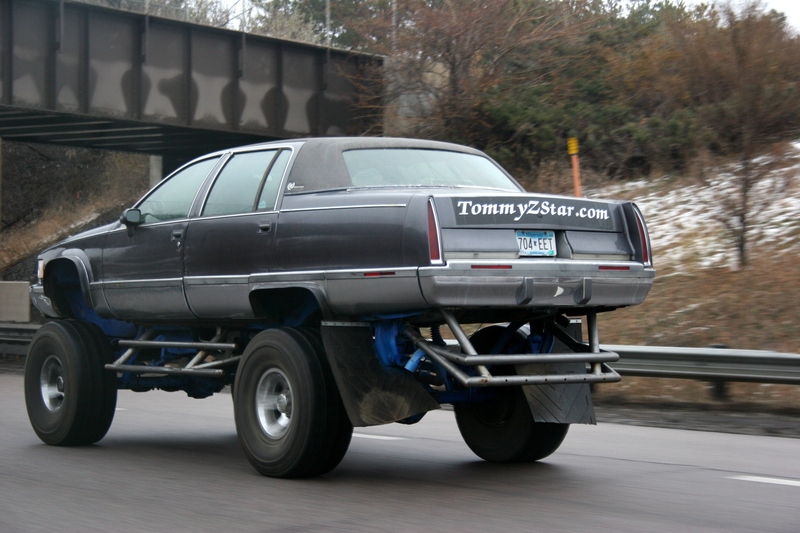 Is this street legal in Minnesota, or anywhere? How do you get in and out of this Cadillac? I’M NO FAN OF METRO TRAFFIC. But then who is, I suppose? 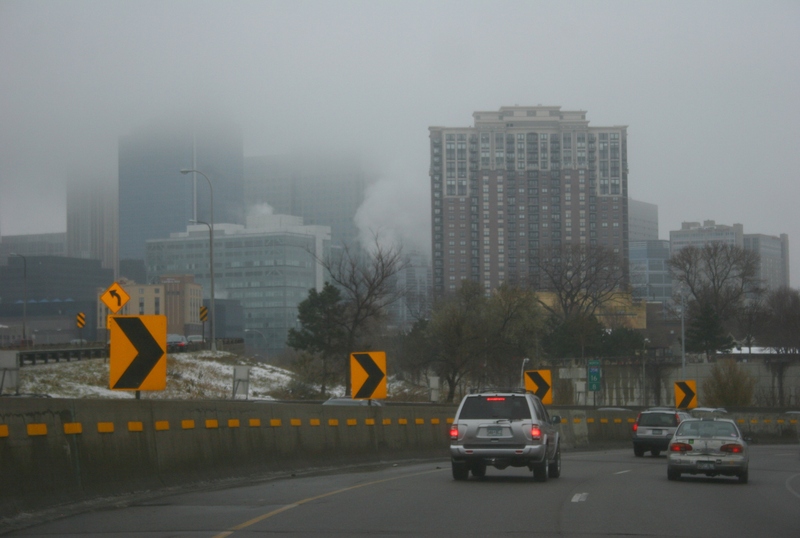 A view of downtown Minneapolis on a foggy Saturday afternoon from Interstate 35. I try to make the best of it, though, to focus on details of my surroundings rather than on the crazy drivers weaving in and out of traffic or the tailgater or the road construction or the sudden flash of brake lights. As you can tell from that second paragraph, my attempts at distracting myself are not all that effective. My primary distraction tool is my camera, typically at the ready to photograph whatever unfolds before me from the front passenger seat. 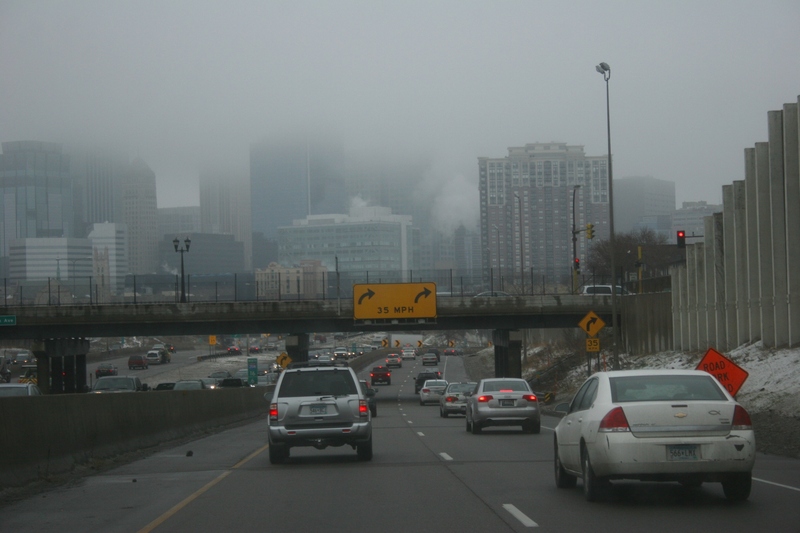 Why are the interstates around downtown Minneapolis so curvy? 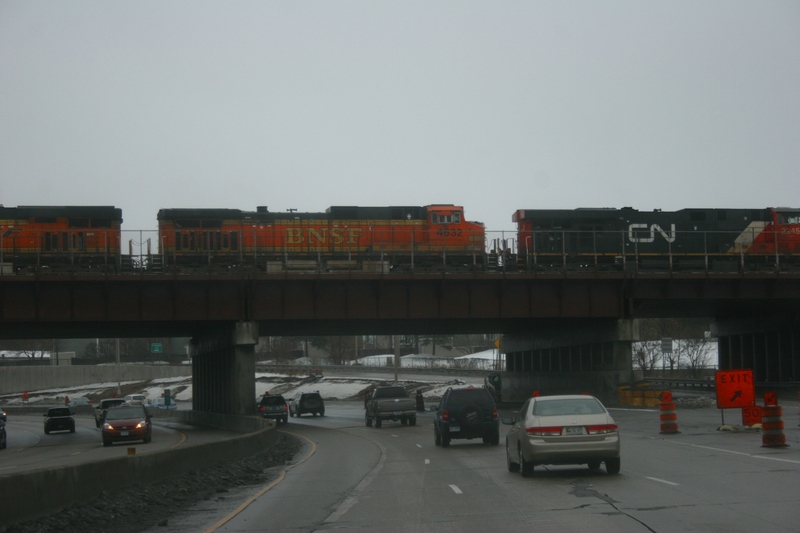 On Saturday, while traveling Interstate 35 into Minneapolis, I missed two photo ops because my Canon DSLR sat at my feet, zippered inside the camera bag. What was I thinking? After my husband noticed a dog with his head hanging out a truck window (why do dogs do that?) and after I spotted a woman texting while driving, I snatched my camera from the bag. I wasn’t about to miss more such photo opportunities. 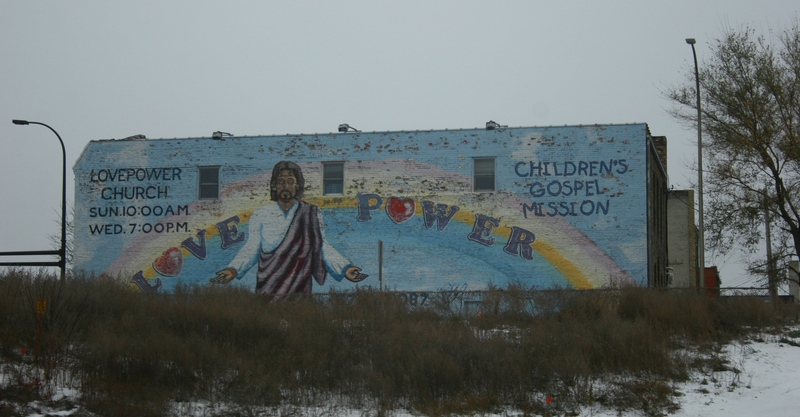 One of the few scenes I shot while traveling Interstate 35 into Minneapolis. As Red Wing, Minnesota photo blogger Dan Traun advises, “You always have to be ready.” And Dan is. Among his photographic specialties are shooting streetscapes and everyday slices of mostly metropolitan Minnesota life. He’s good, no great, at what he does. His timing is uncanny as is his ability to notice a scene worth documenting. Most shots are taken from his vehicle. Approaching yet another curve, this one under a railroad overpass. Dan shows you buildings and everyday life and streets and alleys and all those subjects folks see daily, but perhaps don’t notice like they should. We should all slow down and appreciate life. Even those crazy drivers in the metro. PLEASE CHECK BACK to see the craziest subject I photographed along Interstate 35. Vintage plastic grapes on a vintage food tray, used here for illustration purposes only. Just a little background for those who are unaware: The New York Times recently published an article listing Thanksgiving dinner foods that best represent each state. Grape Salad was selected for Minnesota, evoking the wrath of many a native. Most of us have never heard of the salad and don’t consider it at all representative of our state. But then along come several Minnesota Prairie Roots readers, including DeLores Johnson from Belview in my native Redwood County, MN., who have, indeed, heard of Grape Salad and prepared it. She first made the salad about 10 years ago after discovering the recipe in a newspaper (but not the local The Redwood Falls Gazette). 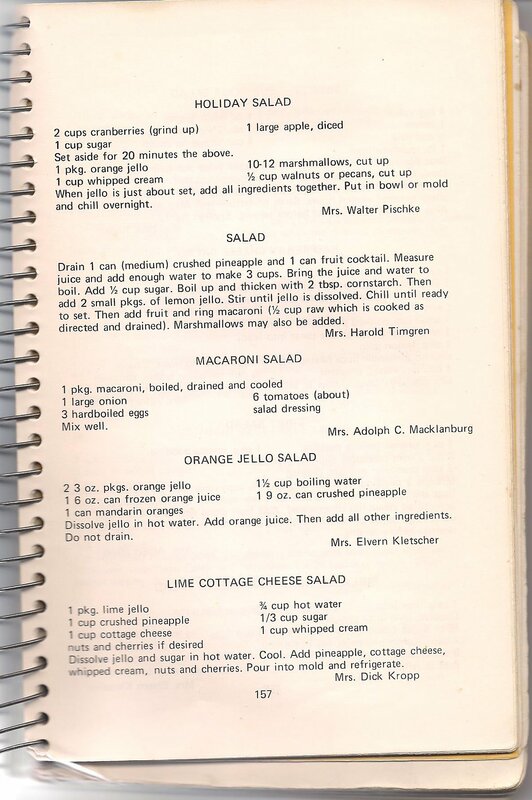 Having never heard of Grape Salad until then, DeLores thought it worth a try although she hesitated to reveal sour cream as one of the four ingredients. But her family loved the salad. Her grandchildren even argue over who gets the last little bit in the bowl, claims DeLores. She doubles the recipe. It’s apparently that good. DeLores terms Grape Salad as “delicious” and says people from all over have called her for the recipe. “I never knew it would be such a hit,” she says. One year, when grapes were especially expensive, DeLores nearly didn’t prepare Grape Salad. But because she knew the kids would be disappointed, she bought what she needed and the grapes cost more than the meat. No wonder she tells her grandkids Grape Salad is special because it’s made with lots of love. So there you have it. That’s DeLores’ Grape Salad story and she’s sticking to it. Mix the dressing and then add the grapes. Enjoy. 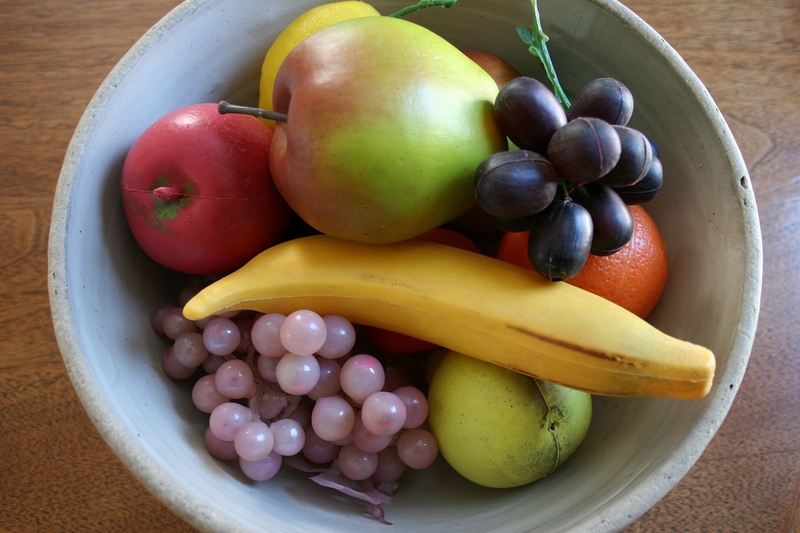 TIPS: For Christmas, DeLores sometimes buys red and green grapes to make a more colorful holiday salad. Grape Salad can be prepared a day in advance, refrigerated and stirred just prior to serving. FACT: When DeLores was growing up, the only grapes she had available to her were wild grapes like those used to make jelly. NOW THAT THE LUTHERANS and my native Redwood County, MN., have been drawn into the New York Times Great Grape Salad Controversy, I feel obliged to also join the discussion. 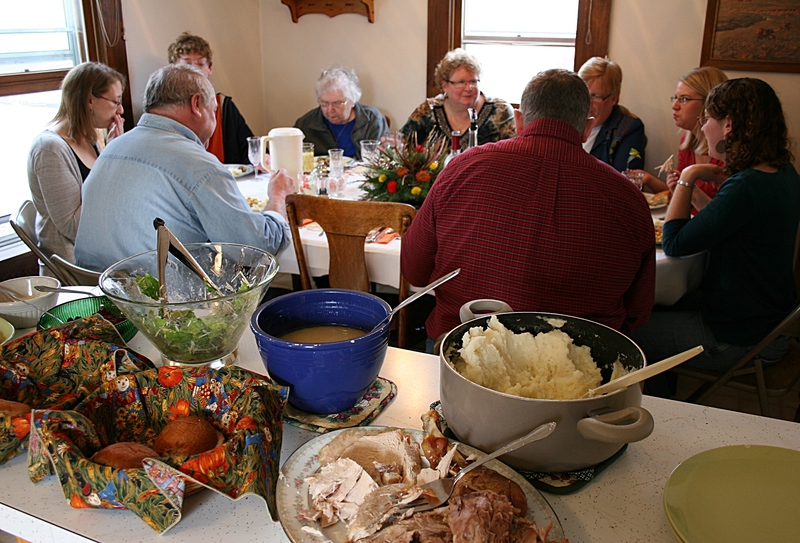 Thanksgiving Day dinner at my house with family several years ago included these foods. To the left you’ll see a nearly empty bowl of a lettuce salad. Minnesota Prairie Roots file photo. Here’s the background, just in case you’ve had your head stuck in a snowbank the past several days and are unaware of the Times article. Writer David Tanis chose a food to represent each of the 50 states (plus Washington, DC and Puerto Rico) on the Thanksgiving dinner table. For Minnesota, he selected Grape Salad. That choice has resulted in a backlash from Minnesotans unhappy, and that’s putting it mildly, with the selection. The only grapes you will find sitting out at my house for Thanksgiving are these grapes in a bowl of vintage fake fruit I got from my mom in September. I’d guess they are vintage 1950s or 1960s. It is, according to the Times published recipe, a combination of grapes, sour cream and brown sugar. Tanis shares on his Facebook page that the recipe was a staple in 1950s and 1960s Minnesota Lutheran cookbooks and was even published in the Redwood Falls Gazette. Hmmm. But I’ve never heard of Grape Salad, let alone tasted it and I grew up in the 50s and 60s on a crop and dairy farm 20 miles west of Redwood Falls near Vesta, where I attended St. John’s Lutheran Church. The Gazette arrived in our rural mailbox each week. 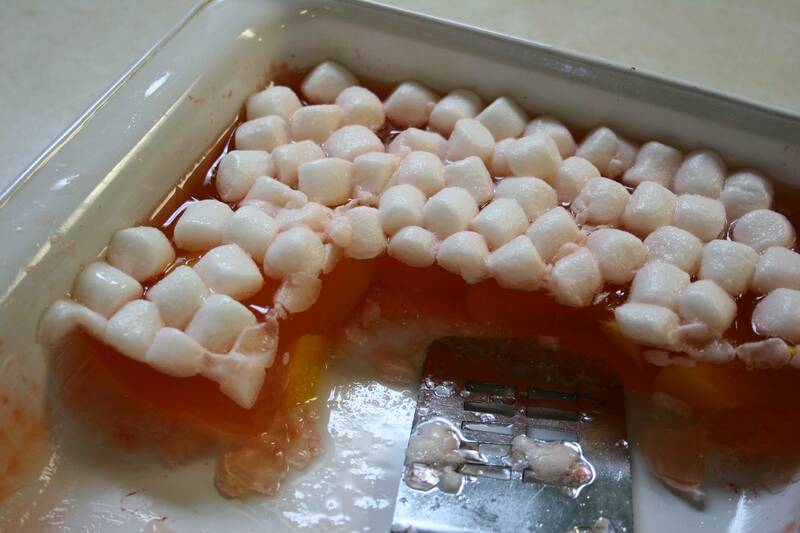 Several years ago my friend Kristin prepared peach-filled Jell-O for Family Game Night at the Lutheran church I attend in Faribault. Minnesota Prairie Roots file photo. The go-to salad during my youth was Jell-O, specifically red strawberry Jell-O laced with bananas and maybe topped with whipped topping, but not usually. Jell-O was served only on special occasions, like a holiday or on the midnight lunch table at extended family birthday and anniversary celebrations. The last time I ate Jell-O was a few weeks ago while on a pre-colonoscopy diet. Otherwise it’s been years since gelatin touched my lips. 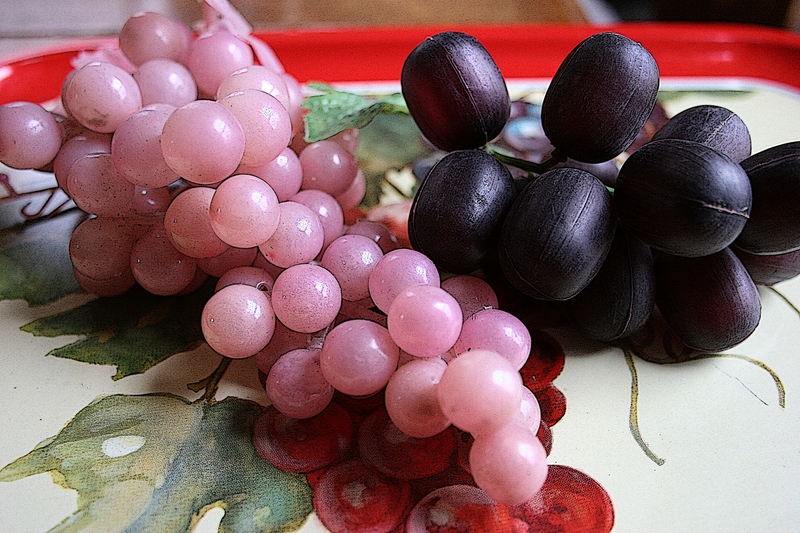 As for grapes, they were a rare treat in my childhood home due to lack of availability and cost. And when Mom did buy grapes for her six children and farmer husband, the fruit was devoured in an instant. I remember stuffing grapes into my mouth so fast that I would nearly choke. But if I didn’t, I wouldn’t get many and I loved grapes. Still do. 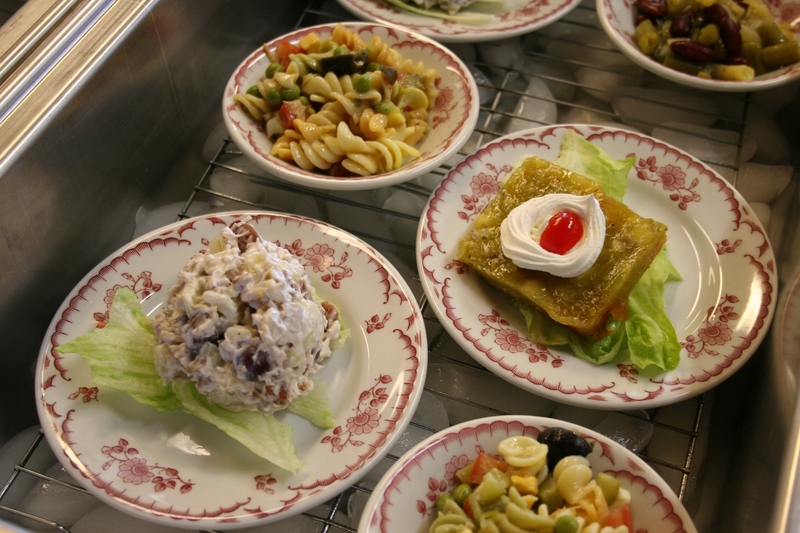 A few of the salad bar options at a 2011 soup and salad luncheon at St. John’s United Church of Christ, Wheeling Township, rural Faribault, MN. Minnesota Prairie Roots file photo. So for Tanis to choose Grape Salad as representative of Minnesota for Thanksgiving dinner 2014, or even Thanksgiving dinner 1960, seems, well, not at all Minnesotan. What food would you select to represent Minnesota? Even though (most) Minnesotans believe the Times writer got it totally wrong with his Grape Salad choice, this whole controversy serves some good, too. The spotlight is shining on our state. What a great time to showcase Minnesota foods and our uniqueness. Specifically, I hope tourism folks in my native Redwood County realize this opportunity and run with it in a creative and humorous way. 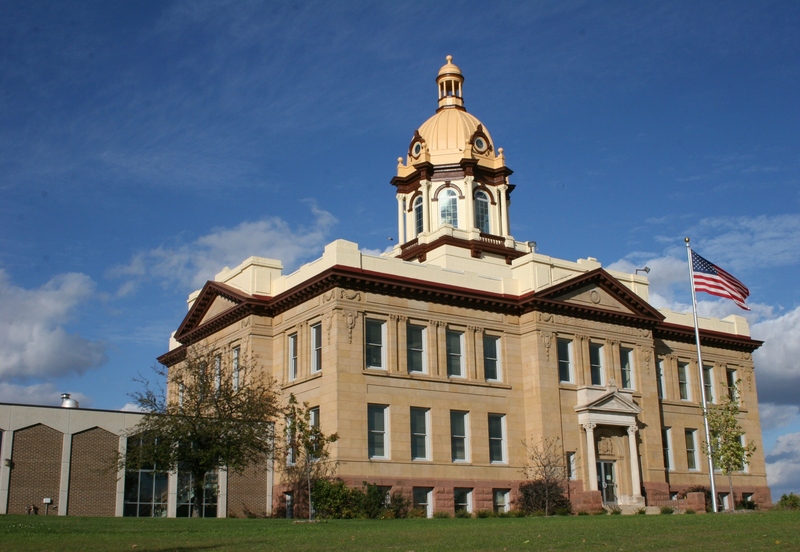 The stately Pierce County Courthouse in Ellsworth, Wisconsin. IT’S AN IMPRESSIVE BUILDING defining a hilltop in the center of Ellsworth, The Cheese Curd Capital of Wisconsin. 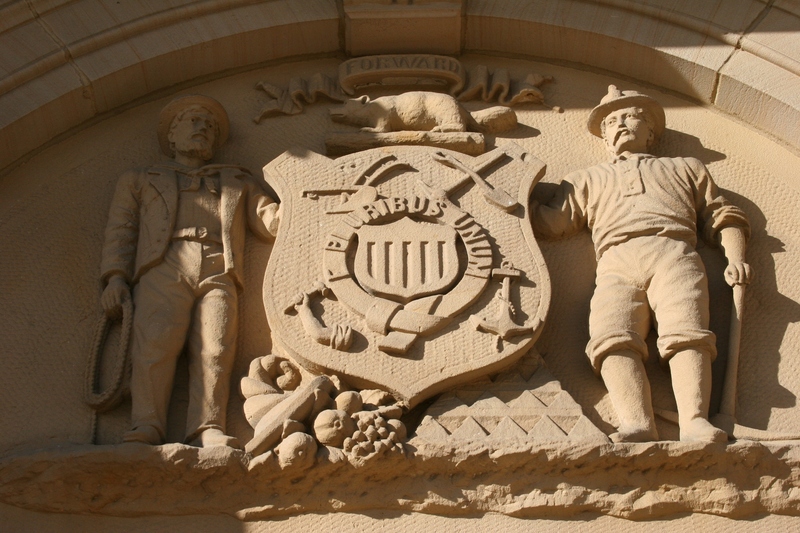 This beautiful stone sculpture rises above the front courthouse entry. Anyone know anything about the sculpture? 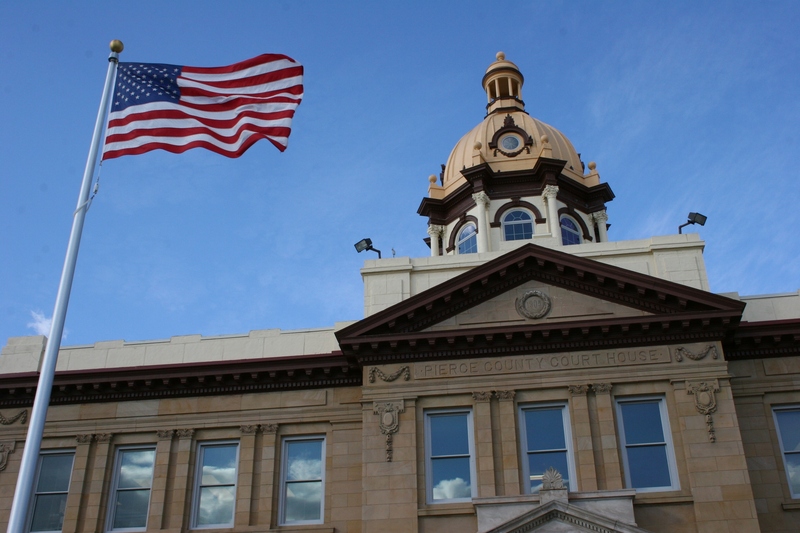 Stately columns, a dome, stone sculptures and a certain sense of strength mark the Pierce County Courthouse constructed in 1905 at a cost of $85,000. After picking up coveted cheese curds at Ellsworth Cooperative Creamery, my husband and I returned to the courthouse we’d passed along Main Street en route to the creamery during an early October visit. We both appreciate old architecture and the courthouse, which is on the National Register of Historic Places, seemed a must-see. Up close details of the upper exterior. 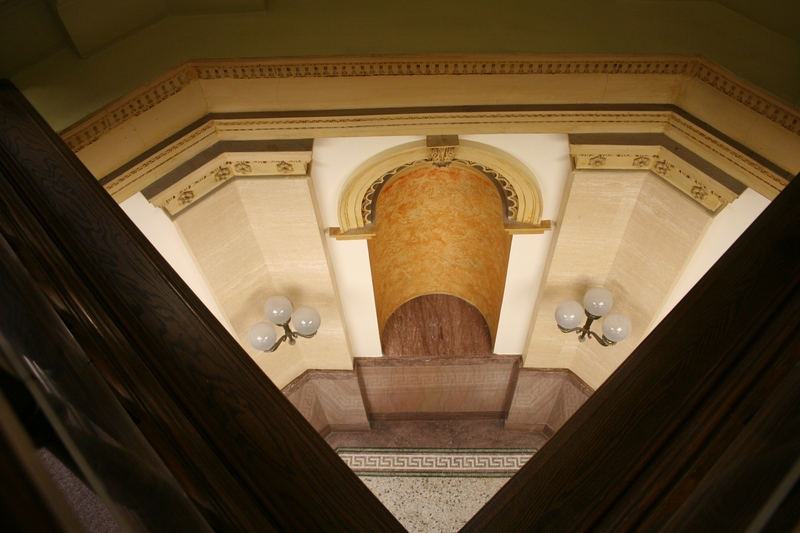 Designed in the Beaux Arts Style of architecture by St. Paul architects Buecher & Orth, this massive structure presents a powerful presence, seemingly fitting for a place that serves as the center of county government and houses the courts. A jail was built adjacent to the courthouse and completed in 1968. 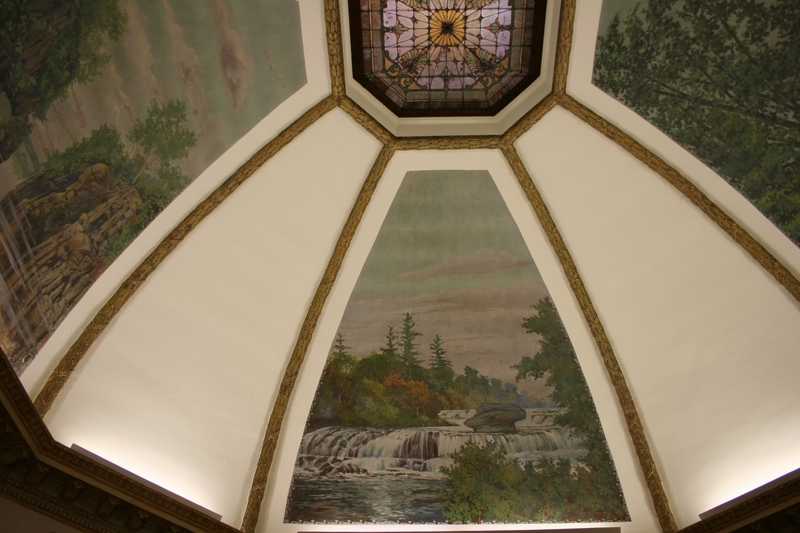 Rotunda murals depict the area’s natural beauty. 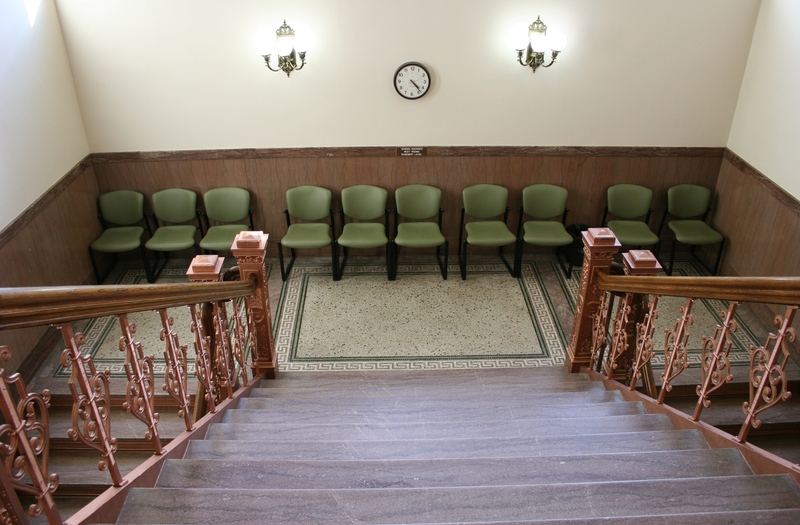 Public seating along the stairway landing. Details on the stairs credit the source of the work. Look at that beautiful floor. The law, in the form of a deputy sheriff, showed up when we self-toured the public space of the courthouse. I don’t know if he was dispatched to check out “the woman with the camera” and her companion or he simply happened upon us. But I sensed that we were being watched. And I suppose that’s OK in today’s world. Looking down from the rotunda. Our tour proved brief given the public space is small and I wasn’t about to enter the courtroom, although I was tempted. 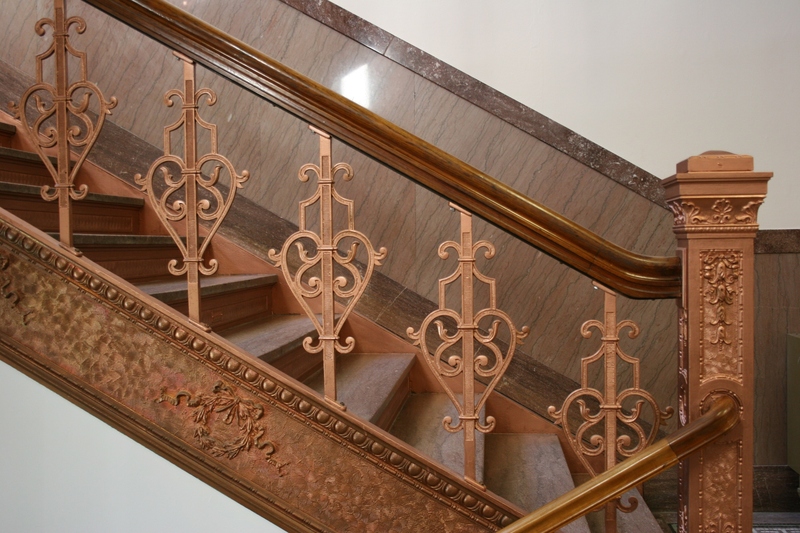 Beautiful railings, although my husband questioned whether the color is original or mimics the original. Interestingly enough, the Pierce County, Wisconsin, courthouse has a twin courthouse in Rugby in Pierce County, North Dakota. Same architect. Same style. 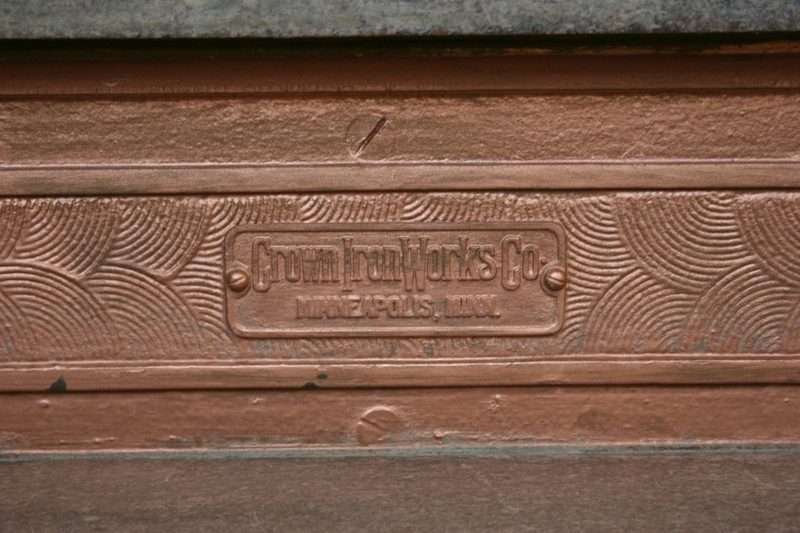 Built in 1908 and also on the National Register of Historic Places. 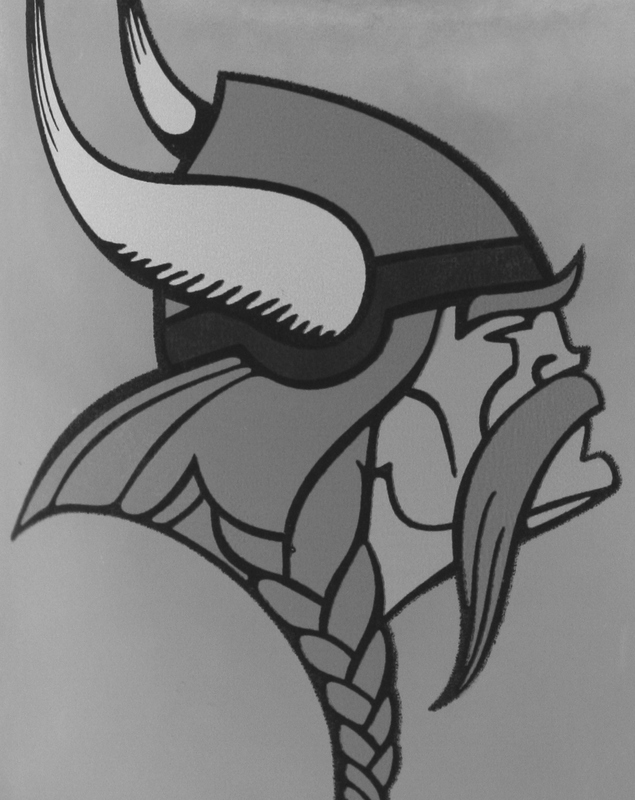 Minnesota Vikings mascot photographed on a mug belonging to my husband. BEFORE I GET INTO THE HEART of this post, you need to know that I don’t care about sports. Not one iota. Never have. Never will. In my opinion, sports have overrun our society, sucking away family time, assuming a pedestal of importance above all else, and more. Yes, I recognize the value of athletics in teaching teamwork, building confidence, providing an outlet to exercise and serving as entertainment. But there needs to be a balance. Sports should not run our lives. I don’t understand, either, the high value and adulation bestowed upon athletes, especially professionals and specifically football players. Why do (did) people admire guys like Minnesota Vikings player Adrian Peterson, who beat his son? That the National Football League has now suspended Peterson without pay for the rest of the season was the right thing to do. Absolutely. This sends a strong message that criminal behavior will no longer be tolerated. Or at least I hope that’s the intent. Maybe it’s more about public relations or sponsors or appearances. I never felt that Peterson was truly sorry for beating his four-year-old, especially given his no contest plea to the misdemeanor charge of reckless assault. Maybe sorry he was caught and sorry he couldn’t play football. But not truly repentant. He didn’t appear genuinely remorseful. Then there’s Ray Rice, the former Baltimore Ravens player who knocked his then fiancee’ (now wife) unconscious in an elevator. The domestic assault was captured on videotape. He’s appealing his indefinite suspension from the NFL. Really? Domestic violence should not be tolerated, no matter the perpetrator or victim. Never. Ever. Perpetrators must be held accountable. On their first offense. 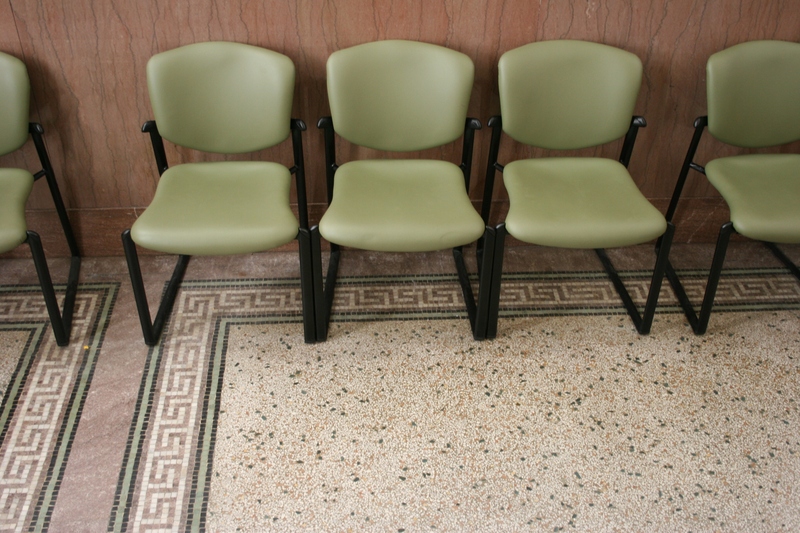 Why are there second offenses and third and…? Why? My stomach churns when I read stories about men like Rice and NFL codes of silence on domestic violence. Enough, people. Enough. No sport is worth excusing and/or overlooking the crime of assaulting a man, woman or child.